A solo survey of the last 25 years of photographic work by Margaret Morton, professor in the School of Art, has been selected as one of the top photo shows of the summer by Time Out NY and highlighted in The New Yorker. 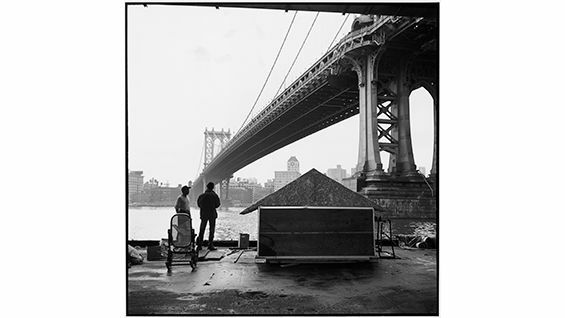 Opening at Leica Gallery, around the corner from The Cooper Union, in June, "Margaret Morton: A Retrospective" has been extended to August 22. "My focus in all my work has been alternative-built environments—spaces built by non-architects," Professor Morton, who has taught at the school for 35 years, told us in an interview. Her work in the 1990s captured the dwellings of Manhattan's homeless population, resulting in four books. This work forms the bulk of the retrospective exhibition. "Margaret Morton has been doing remarkable, indeed invaluable, work at the juncture of photography and social documentation. She is our modern-day Jacob Riis," Phillip Lopate wrote about Glass House, the fourth of these. The exhibition also includes work that appears in her most recent book, Cities of the Dead: The Ancestral Cemeteries of Kyrgyzstan (2015, University of Washington Press). It features photographs taken in Central Asia of slowly decaying funerary monuments. An accompanying solo exhibition of that work appeared in the Arthur A. Houghton Jr. Gallery. Professor Morton took us on a tour of that exhibition back in February.